^ a b c Froese, Rainer and Pauly, Daniel, eds. (2006). "Mallotus villosus" in FishBase. April 2006 version. 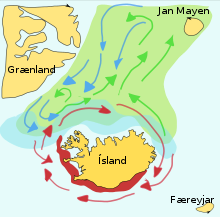 ^ Barbaro1 A, Einarsson B, Birnir1 B, Sigurðsson S, Valdimarsson S, Pálsson ÓK, Sveinbjörnsson S and Sigurðsson P (2009) "Modelling and simulations of the migration of pelagic fish" Journal of Marine Science, 66(5):826–838. ^ Mallotus villosus (Müller, 1776) FAO, Species Fact Sheet. Retrieved April 2012.